Not all rodents that resemble rats are members of the "Rattus" genus, but according to rat expert Dr. Anne Hanson, almost all pet rats, even the fancy ones, are "Rattus norvegicus," or Norway rats. While the bodies of these rats average about 8 inches in length, far more size diversity exists in the wild, where some species of rat and rat-like rodents reach the size of raccoons. Gambian giant pouched rats have been called the world's biggest rats, but rats discovered in 2009 in Papua New Guinea are just as long, and rats farmed as livestock in China are just as hefty. With the descendants of pet Burmese pythons still multiplying out of control in Florida's Everglades, the Sunshine State is now trying to prevent the proliferation of Gambian giant pouched rats. More than a decade ago, eight of these hulks were released on an island in the Keys by an exotic pet breeder. So far, extermination efforts have been unsuccessful and authorities fear they will reach the mainland and wreak havoc with Florida's ecology. According to "Time for Kids," this animal grows up to 3 feet in length and can weigh 9 pounds. Maximum estimates on the Gambia Information Site are much more modest: 17 inches and 6 pounds. 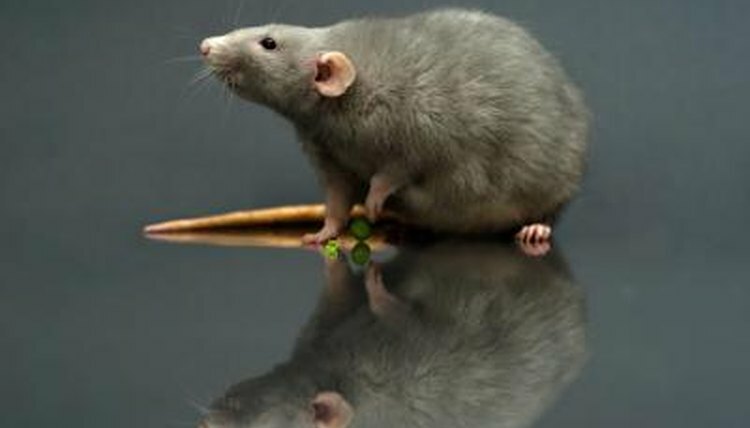 However, if the rats have a better diet in the U.S. than in Africa, both sources could be right. In 2012, a pensioner living on a riverside farm in England killed the largest rat he'd ever seen with a hunk of wood. When he tried to pick it up with a paddle, it broke under the animal's weight. Photographs support the man's claim that it was 4 feet long but are otherwise too blurry to make out much detail. Some people suggested the animal was actually a coypu or nutria, also called a "river rat," a large South American rodent raised for its fur. The coypu became a major problem in the U.K. after some escaped from a farm and started breeding in the countryside but, by 1987, this wild population had supposedly been wiped out. Moreover, according to National Geographic, adult coypu don't grow much longer than 2 feet. Unfortunately, the pensioner burned the body before the mystery could be cleared up. In a 2009 expedition to investigate the crater of the extinct Borsavi volcano in the highlands of Papua New Guinea, a BBC film crew discovered a 32-inch-long rat, weighing 3.3 pounds, with a thick silver-brown coat. "This is one of the world's largest rats," said mammalogist Dr. Kristofer Helgen of the Smithsonian's National Museum of Natural History, who accompanied the expedition. "It is a true rat, the same kind you find in city sewers." As of early 2013, it still hadn't been given a scientific name but was provisionally being called the Borsavi woolly rat. Prior to this, six other species of giant rat had been discovered in Papua New Guinea. All seven are classified as belonging to the Mallomys genus in the Muridae family of rodents. Stir-fried rat might not be to everyone's taste, but in China, this delicacy costs four times the price of pork and chicken and is believed to cure baldness. In the country's bamboo belt, rats are a form of livestock, raised for meat and fur. Chinese bamboo rats are big by nature, but when they're deemed to be market-ready, they can tip the scales at 9 pounds and measure 20 inches in length. Rat Systematics: Rat Species, Strains, Breeds and Varieties; Anne Hanson, Ph.D.